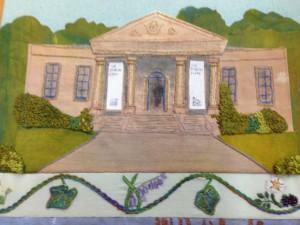 Twenty textile artists have collaborated on the new banner, sewn by the members of the Stirling and District Embroiderers Guild. 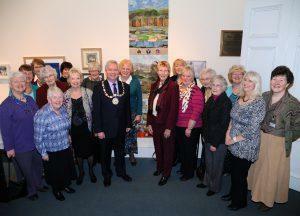 With the 140th birthday of the Smith, the 700th anniversary of Bannockburn, the centenary of the Great War, and the 50th anniversary of the Stirling – Dunedin twinning, the Year of Homecoming 2014 is a special year for Stirling and the Guild members have created a new work of art to mark it. Drawing all of the threads of history together has been a year-long labour of love for the artists. Depicted on the banner is the Stirlingshire landscape, wild flowers, and some of the best built heritage – the Castle, Wallace Monument, Bannockburn, Cambuskenneth Abbey, the University and the Smith itself. The Stirling Heads make a special appearance. The banner has been skilfully constructed in three parts, allowing each of the parts to be displayed separately, in different places, if required in future. Provost Mike Robbins, who is also a Smith Trustee, welcomed the Banner to the Smith. The Banner is in the Stirling Threads exhibition in the Stirling Smith, which runs until 6 April and includes everything from a Bishop’s Preaching Scarf to a pair of shoes made for a fairy and finely embroidered evening bags.